​The Baby Boomer generation remembers well the St Croix Hotel on Main Street, a hotel which in its early days was actually quite grand and elegant. 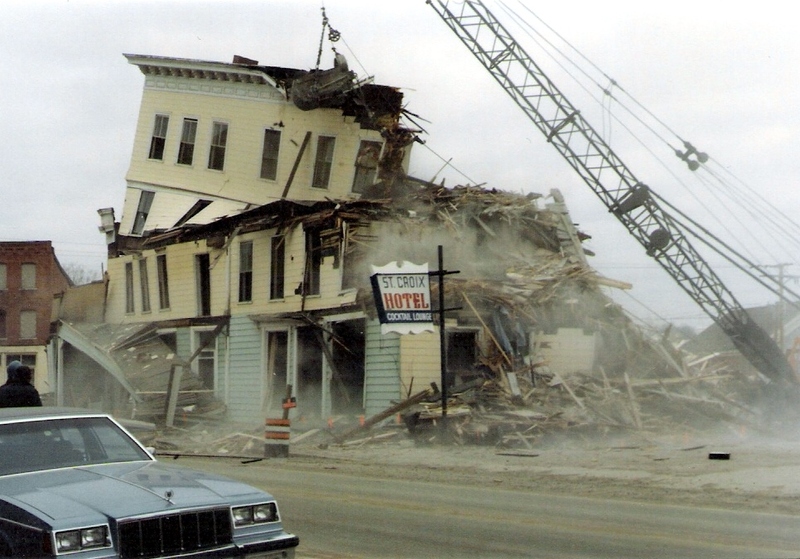 It is now the site of Triangle Park. 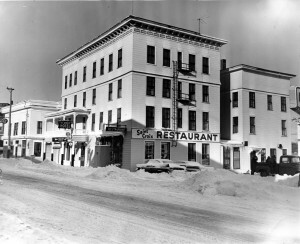 By the 1950’s its early elegance was no longer readily apparent and by the 70’s and 80’s folks looking for room stayed at the International Motel or Stable Inn. Still six Greyhound buses a days stopped at the St Croix to pick up and drop off travelers, the restaurant was very nice and the lounge seriously rocked on the weekends. 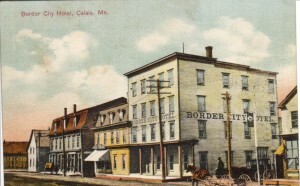 Over the years it was pictured on many Calais postcards and people will sometimes give us a postcard or photo of what they are sure is old “St. 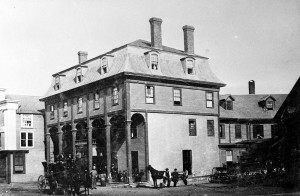 Croix Hotel”. 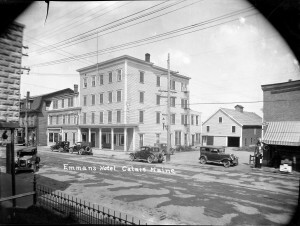 It often isn’t- it is photo of the “Emmans Hotel”. 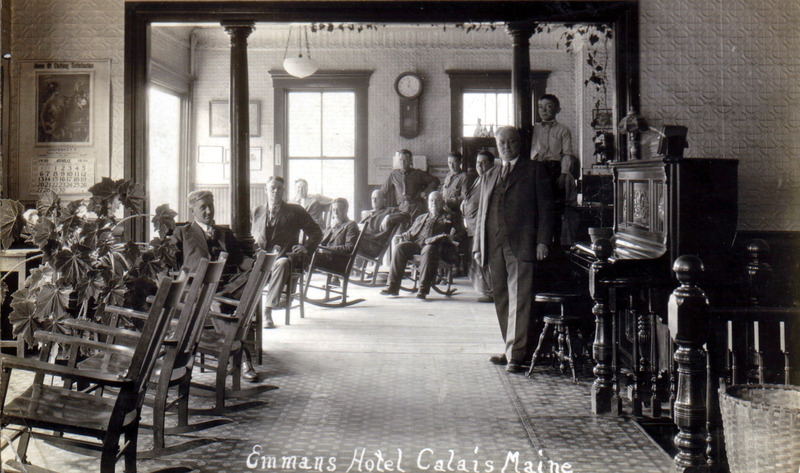 The Emmans was down the street from the St Croix and a pretty modern place when built by Dan Gardiner in 1885. At the time it was called the Border City Hotel as shown by this postcard from about 100 years ago. The Emmans burned in the late 30’s. The J.D. 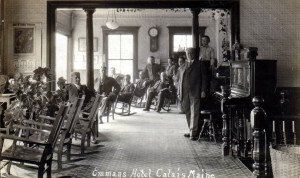 Thomas filling station was built on the site.We can date the photo below of the Emmans lobby to 1930 by the Unobskey’s calendar on the wall. A few more words about the St Croix which has a longer and more interesting history than the Emmans. 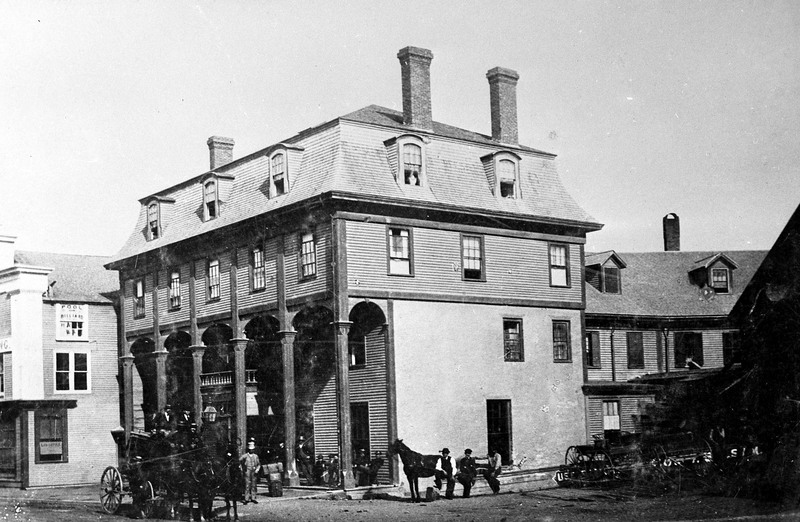 It was built in 1829 by John Bain and was then known as the Emerson House and had several names and proprietors until 1874 when it became know as the St Croix Exchange,and later after a fire required removal of the top floor, the St Croix Hotel. It was the stagecoach stop in Calais for well over 100 years. It was demolished in 1983.